Arya Vaidya Sala has been conducting annual Ayurvedic seminars in connection with the Founder’s Day Celebrations since 1964 and All India Essay Competitions since 1965. The proceedings of seminars and prize winning essays are being published regularly. They cover a wide range of topics and have become a veritable source of information to the students and researchers in the field of ayurveda. 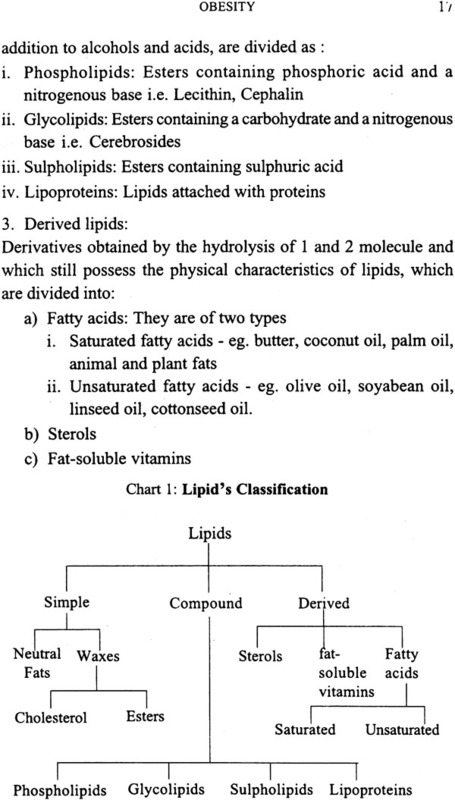 Obesity was the topic for essay competition in 2006. 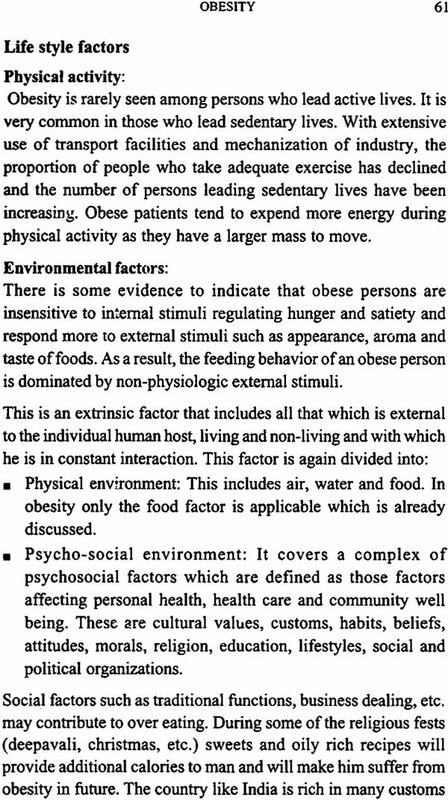 Obesity is a condition in which physiological equilibrium is disturbed due to the abnormalities in the functioning of the various body systems. This provides a platform for many ailments such as hypertension, diabetes mellitus, coronary heart disease, osteoarthritis, infertility, impotency and psychological disorders like anxiety, depression, etc. thus the mortality and morbidity rates are more in obese persons. 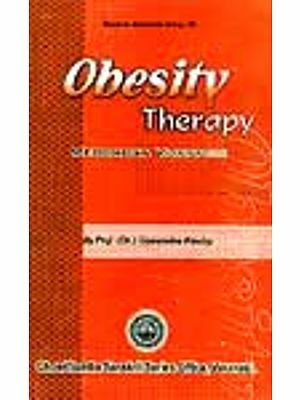 This book provides a clear picture on the various aspects of obesity including its etiology, pathogenesis, clinical features and management. 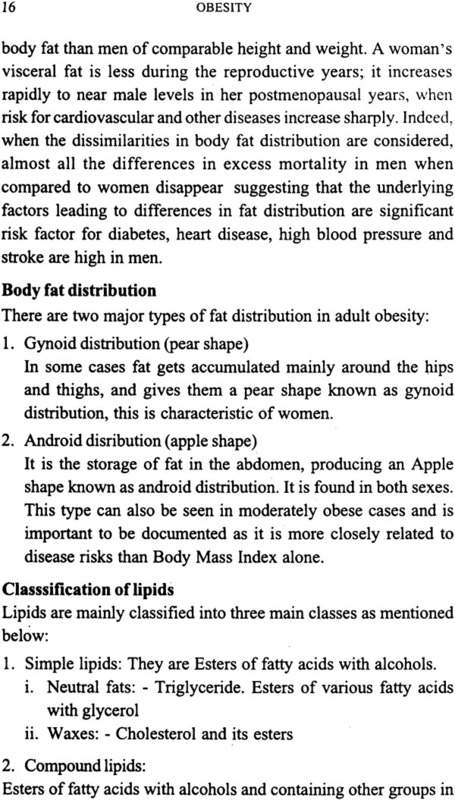 This essay, ranked first in the competition, deals with all the aspects of obesity. Hope that this will be useful for students and scholars alike. The conceptual and operational framework of ayurveda is wide enough to include all that is essential to make a man healthy and happy. It includes the study of all right conduct, dharma, which is necessary for the healthy growth of society in which the man lives. Further, it deals with the philosophical aspect of life, the knowledge of which greatly contributes to the comfort and happiness of all human beings. This makes one comprehend the ultimate reality that human efforts are limited. The maintenance of positive health and the treatment of disease are the two main objectives of ayurveda. Based on these, ayurveda can be classified into two (1) healthy man’s regimen - the science of svasthavrttam and (2) patient’s regimen - aturavrttam. 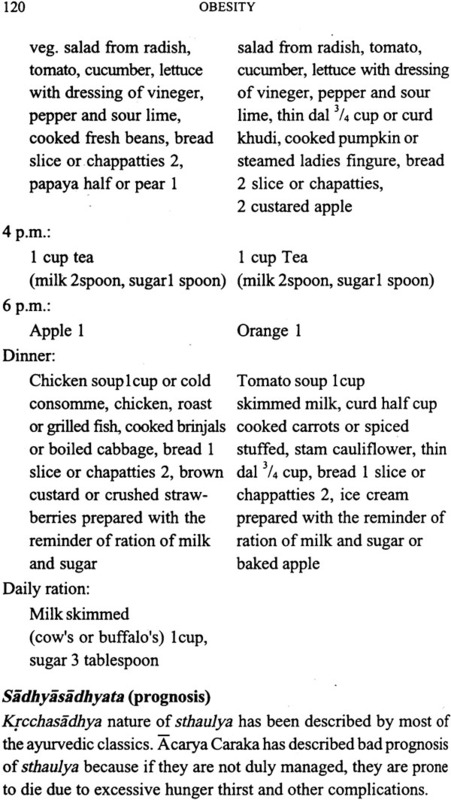 The observance of systematized daily routine, dinacarya, life in accordance with the seasons, rtucarya and well planned schedules of diet and exercise help one maintain this. Ayurveda stresses on the need to maintain personal, social and civic hygiene for the orderly upkeep of positive health. This system recognizes the role of the mind in the causation and cure of diseases. So strict mental discipline and adherence to moral values are considered a pre-requisite for health. Therefore, sadvrtta, the ethical basis of life is described as an important health support system. The foresaid principles seem to be a hindrance in this modern life of materialism. A recent world health study reports that obesity is includes among the top ten selected risks to health. 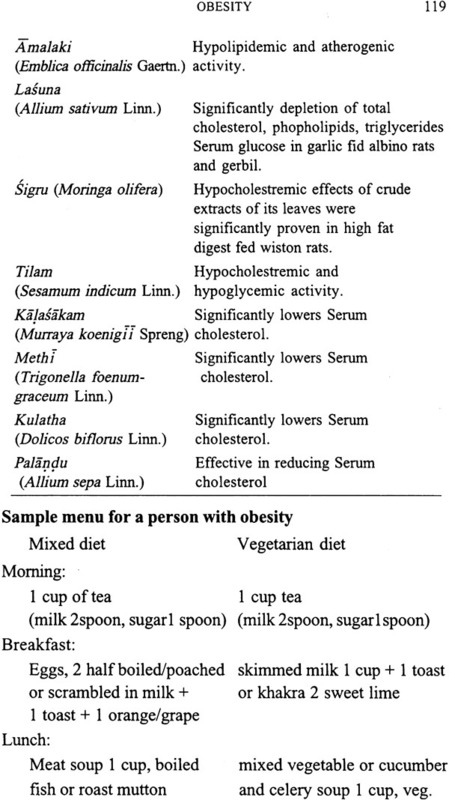 Sedentary life-style and inclusion of increased intake of oily and fatty food in the daily diet result in this disorder. Sthaulya (obesity) is such a disease, which provides the platform for so many hazards like hypertension, coronary heart disease, diabetes mellitus, osteoarthritis, infertility, impotency as well as psychological disorders like stress, anxiety, depression, etc. these indicate the weakening of the various body systems which in turn affects the physiological equilibrium. Thus the mortality and morbidity rates are more in an obese person. Though modern medical science sustains on the advanced technologies and therapeutics for the diagnosis and management of different disorders, ancient medical system fulfill, the health care needs of a vast majority of the population. Now a days, a large section of the humanity globally is returning towards natural ways of life and holistic approaches for the management of different ailments like joint diseases, autoimmune diseases, etc. Ayurveda which is not only a system of medicine but a way of life, advocating prevention of disease as its primary aim and following holistic approach in dealing with different diseases. Sage Caraka has described sthaulya under eight undesirable constitutions (astanindita) based on their ugly/awkward appearance, victims of public abuse, unmanageable health condition. 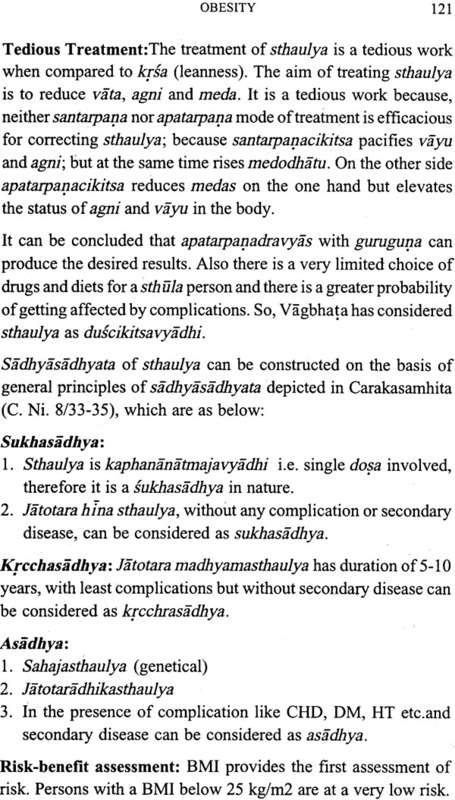 Sthaulya is one among kapha predominant diseases (slesma nanatmaja) involving kapha and medas as main dosa and dusya in the pathogenesis. Caraka clearly mentioned that sthaulya and prameha have a direct relation because both have kledaka kapha and medas dominance in their pathogenesis. Sages prescribed that sthaulya is a bahudosaja disease, which further proves that it is the root cause of many killer diseases like diabetes, hypertension and heart disease. It is one of the yapya (difficult to treat) type of disease; the prolonged prognosis results in exorbitant financial expenses. Obesity is a troublesome and problematic disease for both the patient and the physician, despite the researches and developments made in the modern system and the ancient one. 1 out of every 10 Indian children is corpulent. A survey conducted in cities by AIIMS, Delhi revealed that the waistline had grown around by 30% more. During the last two decades in America, the percentage of people with a Body Mass Index (BMI) greater than 30 kg/m2 has realy been doubled in the case of men whereas it has risen to more than 50% in the case of women. Obesity is ranked one among the top 10 selected health risks. There are more than 1 billion corpulent adults worldwide. At least 300 million peoples are clinically obese. Obesity is killing about 3, 20,000 people in 20 countries of Western Europe. This represents a wake up call to the global community. The prasasta purusa laksana (Ca. Su. 21) are not merely signs but are the criteria for a healthy persons. The sama mamsa caya and sama mamsa pramana possess two angles, which excludes the sthula, krsa, atidirgha and atihrasva types respectively because caya induces deposition and pramana means height and weight. Samapakta and samajara indicate proper status of agni in terms of abhyavaharanasakti and proper jaranasakti. It is the cause effect relation, that if the agni is good the digestion (jarana) will also be good and distribute equal nourishment to all dhatus, so the dhatus will be in samapramana and sama upacaya. 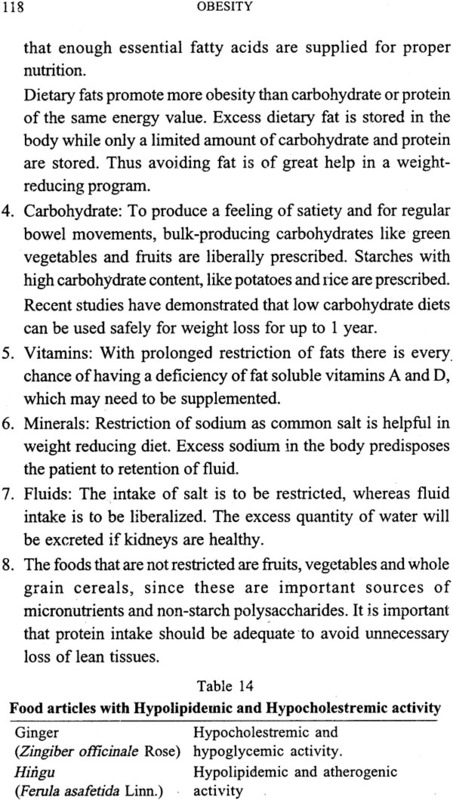 All these conditions prevent the disease, indicating the vyadhutpadabala-pratibandhatvakam (immunity) in a healthy person. Samatva (equilibrium) : A well-built has the following feathures. Sahatvam (Tolerance to): Tolerance of ksudha (hunger), pipasa (thirst), atapa (sun light), saitya (cold), vyayama (exercise) and vikara (disease) normally is suggestive of an individual’s resistance power. This is impaired in cases of obesity and emaciation. 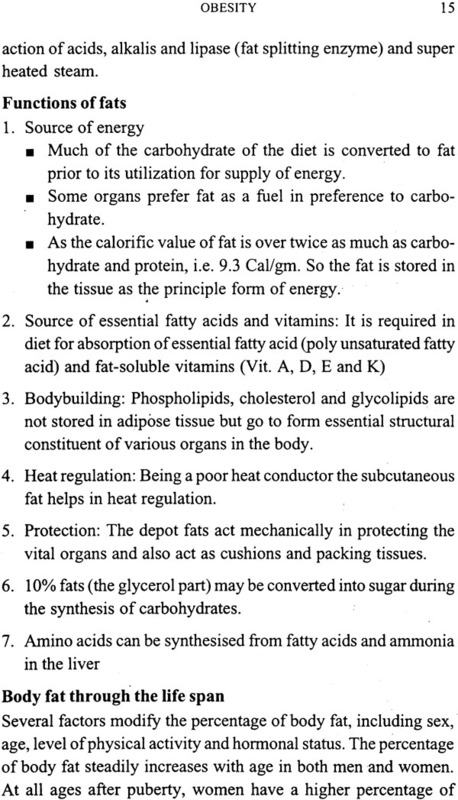 The tolerance of heat, exercise, hunger, etc. if considered as etiological factors, will prove the person’s immunity to defend the disease. Here the somatic appearance is taken into consideration and so it does not include psychologically perverted persons or persons having local impairment of organs. This group consists of some genetic defects, which cannot be cured easily. Acarya Caraka has given special emphasis on treatments relating to sthaulya (obesity) and krsa (leanness / emaciation) because these problems are found in abundance and it has some pathogenesis acting behind it. 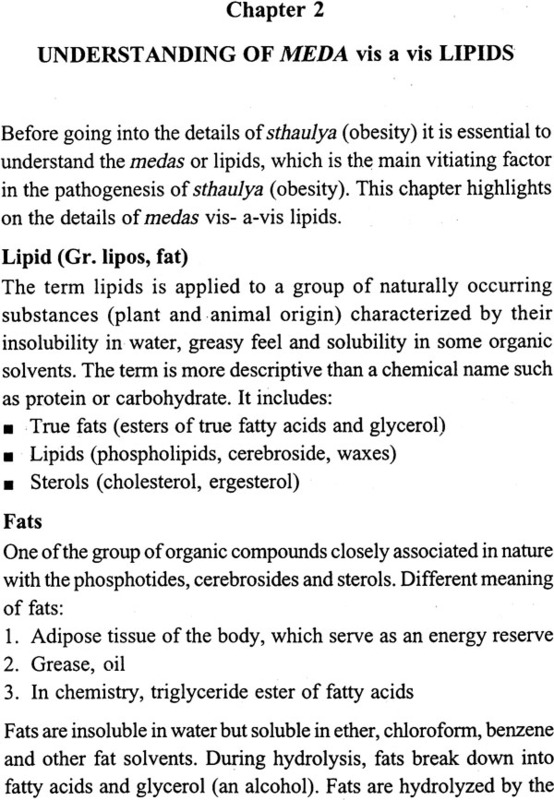 This book focuses on Ayurvedic aspects of medodhatu and sthaulya in detail along with other relevant knowledge of lipids, fats and disease, necessary to know the diagnosis, investigation and management of obesity. Obesity is a condition in which physiological equilibrium is disturbed due to the abnormalities in the functioning of the various body systems. This provides a platform for many ailments such as hypertension, diabetes mellitus, coronary heart disease, osteo-arthritis, infertility, impotency and psychological disorders like anxiety, depression, etc. thus the mortality and morbidity rates are more in obese persons. 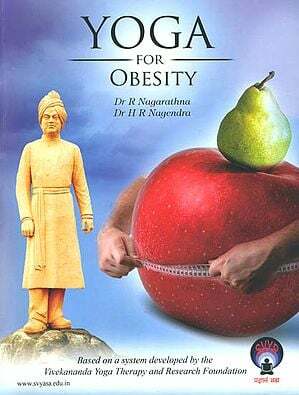 This book provides a clear picture on the various aspects of obesity including its etiology, pathogenesis, clinical features and management.